Though placing bets on players to win the tournament has high rewards, it’s tournament props and matchups that give someone the best chance of raking in a profit. By isolating particular matchups and situations, one stands a better chance of taking advantage of mismatches or taking a side on a prop more favorable to their view of how a tournament will be conducted. It takes a great deal of homework and preparation to successfully bet on props, but if one puts in the work it can be quite a successful way of adding to their bankrolls. This prop was talked about on the Masters Preview Podcast, but for those who prefer a more visual breakdown of this prop I’d be happy to accommodate those wishes. Tiger will see that the drive requires a left to right shot shape back towards the middle of the fairway. That’ll give him a nice angle into the green and avoid any issues with the greenside bunker short left. It’s about 295 yards to the middle of the fairway bunker on the right, and in his last few appearances Tiger has been long enough with his 3 wood to set up a manageable yardage for his second while still keeping his tee-shot short of the bunker. With the fairways soft from all the rain leading up to the tournament, however, he might have to hit driver so he can avoid having to hit into the difficult 1st green with a long iron. Tiger has admitted that even he has first tee jitters, and when he’s faced opening tee shots that required fades it’s often led him into trouble. His prominent miss is a double cross left into the pine trees, which is what he did on his opening tee shot here in 2018. He also is susceptible to blocking his tee shot well right should he keep the clubface open at impact. This isn’t a miss that is exclusive with his driver, as he’s often sent errant tee shots into the rough on his opening hole with the 3 wood as well. Given Tiger’s notorious troubles on opening hole left-to-right tee shots, I love getting +160 that he’ll miss the fairway on his opening drive. The last two Masters has featured tough sledding over the first two rounds, which led to cut lines of +5 (149) and +6 (150) by the end of Friday. But the scoring conditions look to be a little more friendly thanks to some favorable weather conditions over the first two days. Thursday PM: Temperatures climbing into the low 80’s, winds out of SE at 10-13 MPH and subsiding towards the late afternoon. Friday PM: Temperatures climbing to the mid 80’s, winds out of the SW 10-12 MPH with gusts possible to 20 MPH, gradually subsiding through late afternoon. If there was going to be a challenge for the players over the first two days it’ll be on Friday afternoon. The toughest winds a player can face at Augusta National is anything coming out of the west or southwest, and with gusts up to 20 MPH that could be an unlucky draw for anyone with a Thursday AM/Friday PM tee time. But for the other three sessions there shouldn’t be too much adversity in terms of mother nature. The course plays easier in warmer temperatures and when winds are light to moderate, which are conditions expected for the majority of the first two rounds. I expect the cut line to settle around +2 or +3 heading into the weekend, so Under 148.5 at -115 is the play for this prop. Stewart Cink – +110: 2019 marks Cink’s first appearance at the Masters since 2014, and while he has a decent track record at Augusta there will be a little course rust he’ll have to overcome. Cink is also in awful form, averaging -2.25 strokes lost to the field tee-to-green over his last four tournaments and comes in with three consecutive missed cuts. A fourth missed cut in a row is looming. Shane Lowry – +125: Shane Lowry has missed the cut in two of his three Masters appearances, and another missed cut appears likely. Lowry has lost on average just under 1.5 strokes to the field tee-to-green over his last four tournaments on the PGA Tour. His win over in Dubai seems like a distant memory at this point and I don’t see him recapturing any of that magic at Augusta National this weekend. Alex Noren – +137: Alex Noren has missed the cut in each of his two Masters appearances and his form coming in doesn’t suggest he’ll break that streak. On the year Noren ranks 187th in Strokes Gained – Tee-to-Green and has lost strokes to the field in that metric in four of his last five tournaments he’s played. His struggles in 2019 are likely to continue. The case was laid out in the DFS column for why Kisner has a chance to show well at the Masters. As for Patrick Reed, he’s a bit of a mess at the moment. He’s struggled with his ball-striking for most of 2019, but it got so bad at the Valspar a few weeks back that he had David Leadbetter fly in for an emergency lesson mid-tournament. 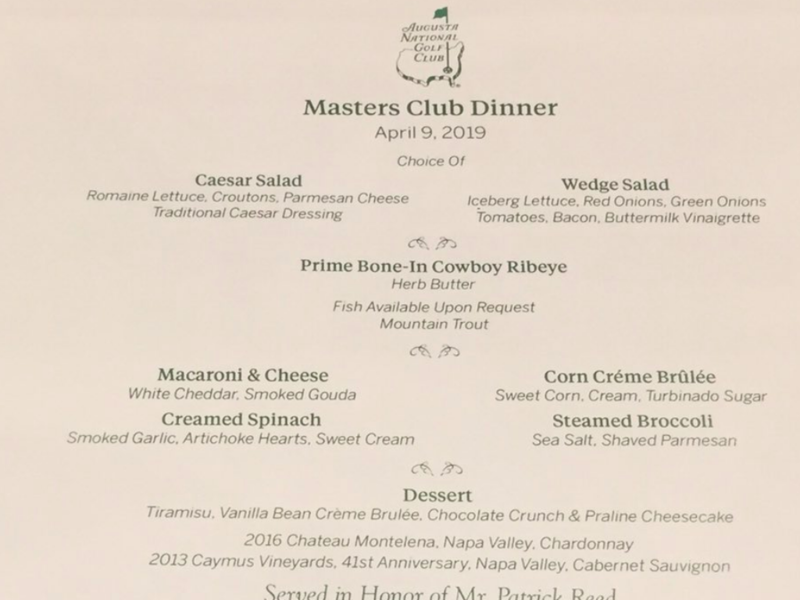 Given Reed’s struggles and all his pre-tournament commitments (including taking everyone to the Golden Corral for the Champions Dinner on Tuesday), I don’t think he’ll grace us with his presence for too long this year. This prop might be sewed up by the end of Friday if Reed misses the cut, and even if Kisner does as well there’s the 1.5 stroke cushion available without having to lay any juice. This is a little more juice than I normally would like laying on a straight up matchup prop. But while I don’t think Dustin Johnson will be winning the Green Jacket, the weather conditions this weekend are setting up for him to have a very solid finish. I like Dustin Johnson to finish inside the Top 10, and if that’s a route you’d rather go his -140 price on the Top 10 prop is certainly an option. If you’d rather stick with just the matchup, Dustin Johnson’s floor is probably higher than Tiger Woods’s ceiling this year. I expect Tiger to show better than he did last year, but anything close to a Top 15 finish would probably be a pretty good result for him given where his ball-striking and form is at. Don’t overthink it – back Dustin Johnson to best Tiger Woods head to head.